Actor Jesse Eisenberg is a first-time father after welcoming a baby boy with girlfriend Anna Strout. 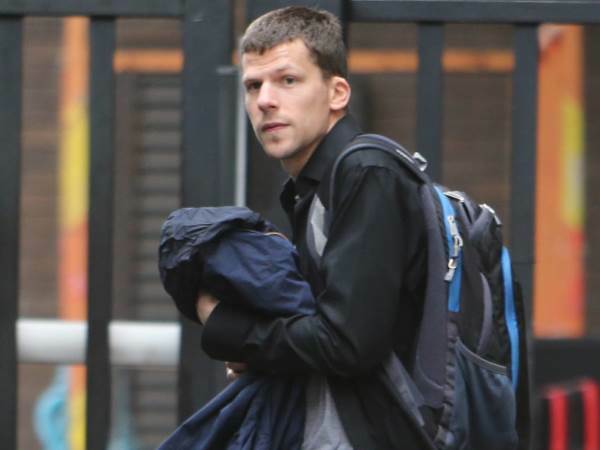 Actor Jesse Eisenberg is a first-time father after welcoming a baby boy with girlfriend Anna Strout, according to reports. The Now You See Me star and his longtime love were spotted walking around New York City with their new bundle of joy on Monday morning. Sources tell E! News the baby is a boy, but further details about the newborn's name, birth date and weight have yet to be revealed by the notoriously private couple. Jesse, 33, and charity worker Anna had been involved in an on-off relationship prior to her falling pregnant, which came just months after they rekindled their romance in January. They initially began dating in 2002 before calling it quits in 2012. Jesse was romantically linked to his The Double co-star Mia Wasikowska during his four-year break from Anna, but it appeared the former lovebirds had too much of a connection and they were often pictured together in cafes and airports during their alleged relationship break. Jesse has been notoriously silent when it comes to addressing his private life in public, but in a rare candid moment during a 2011 Seventeen magazine interview, he confessed that Strout was the only woman he had ever had a serious committed relationship with. Asked for a little romance advice, the flustered actor said, "Oh God, I don't know, just be nice! I've had one girlfriend my whole life. I don't have good advice!" He also hinted that humanitarian Anna's commitment to improving society is what has kept him devoted to her for over a decade, adding, "I find people who want to help other people to be the most interesting. I come from a family of teachers, and my friends are teachers, often times in very difficult school situations. My job is so selfish and focused on my own vanity that I like to surround myself with people who are actually helping people throughout their day."